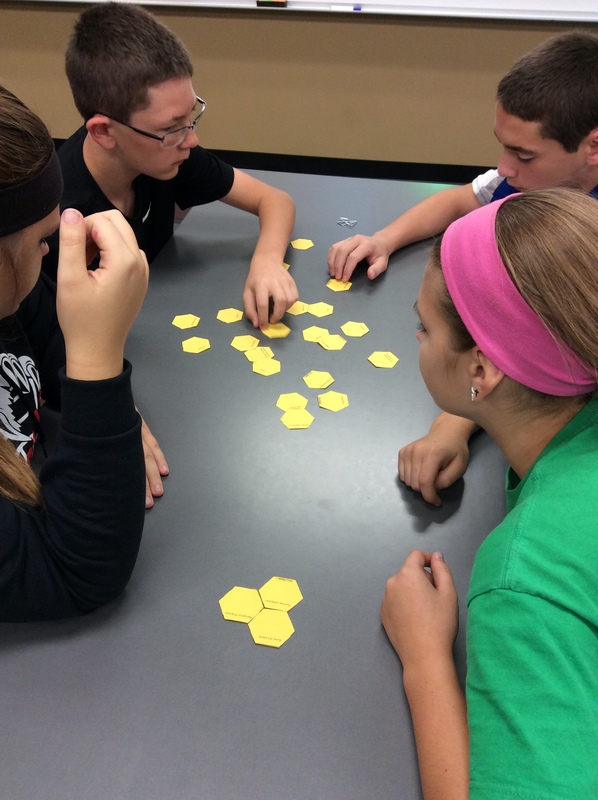 Students in Ms. Green’s class using hexagons to refresh their memories and make connections. I am trying to be more mindful of pulling my students’ learning through this year. You know, revisiting what they’ve already learned so it doesn’t fly out of their brains never to return (at least not to return until their high school American History teacher says they should have learned this in 8th grade and have to review it…). I tried out a neat tool this week with my students that Glenn Wiebe showed the KCSS Executive Board over the summer. 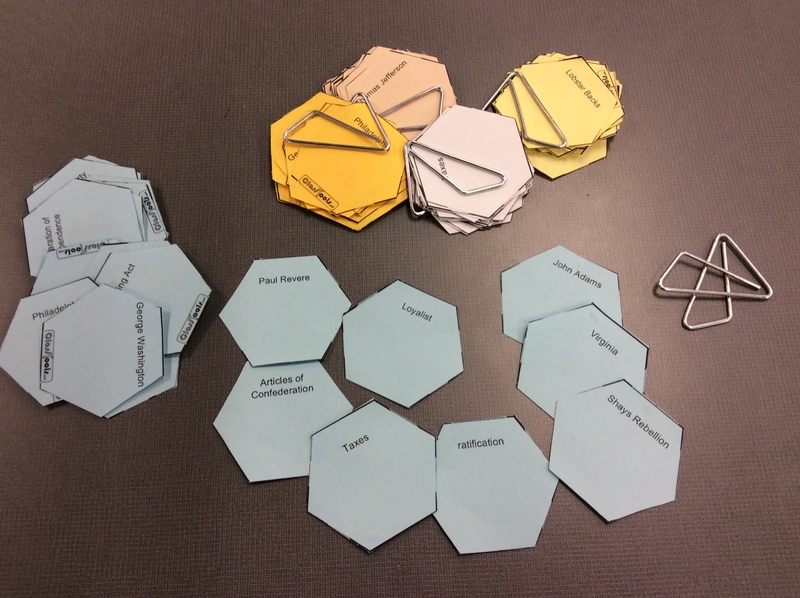 The ClassTools.net Hexagon Generator allows you to select up to 30 terms that will then be placed on little hexagons which you will then have the pleasure of cutting apart (good task for a student aide with time on her hands, wish I had one). 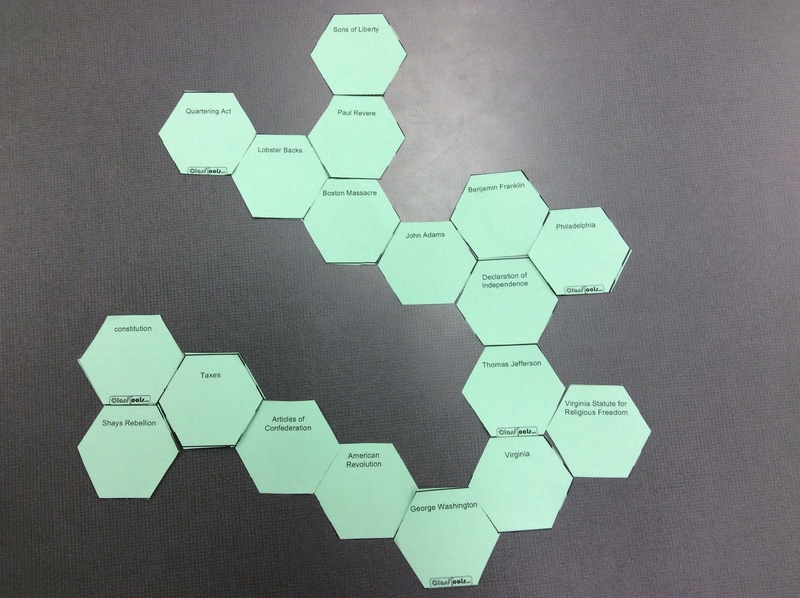 With only three days this week due to Parent-Teacher Conferences I didn’t want to jump into something new before their long weekend, so I decided to roll out the hexagons. I used a mix of ideas, people and events that we’ve covered since the beginning of the year. Each table got a set and my directions – if the terms on their hexagon have a connection they can touch, but for each side that touches there has to be a connection. Walking around the room, asking and answering questions, I got a good idea of what stuck and what didn’t. After they all had the opportunity to make as many connections as possible I had them rotate around the room to see what the other groups had completed. When they returned to their tables they could make some adjustments in case their memories were jogged by their classmates’ work. In one class the groups wanted to debate some of the connections that were made and they had to defend their choices – it made for a good discussion. I see a lot of potential in this activity, it’s a great brain break of sorts and the students seeing all the different ways the terms come together is valuable, I don’t have to answer, “Is this right?” The extension I might try next time is to have them take a picture with their iPads (we’re a one-to-one school) and then write up a defense of their work. Good practice, and in case one student dominated the connections the others have the opportunity to defend or suggest other options. There are so many ways this strategy could be used; the ClassTools.net page has the example of making the seating assignment for a dinner party using figures from WWI. I’m looking forward to trying a variation with the Civil War – can’t wait to see who sits next to whom. How the hexagons can fit together.